Qatar Airways launches flights to Iraq. Erbil, IRAQ – Qatar Airways has extended its Middle East footprint to Iraq with today’s launch of scheduled flights to the northern city of Erbil. The Doha-based airline is operating four-flights-a-week non-stop on the route – the first of two new Iraqi services being launched within two weeks. Effective June 7, Qatar Airways will start flights to the capital Baghdad, also operating four-times-a-week. Both the Erbil and Baghdad services are being operated with an Airbus A320 in a two-class configuration of 12 seats in Business Class and 132 in Economy. Qatar Airways Senior Vice-President GCC, Levant, Iran, Iraq and Indian Sub continent Fathi Al Shehab was onboard inaugural flight QR 446 which arrived at Erbil International Airport to a traditional water salute welcome followed by an airport ceremony attended by local officials. 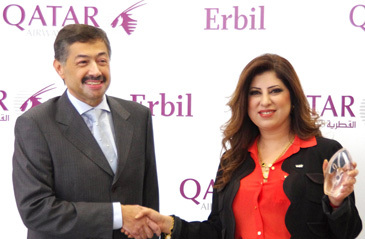 Erbil takes Qatar Airways’ global network to 115 destinations worldwide. Qatar Airways Chief Executive Officer Akbar Al Baker said: “Iraq has long been underserved due to the political and economic difficulties the country has faced over the years, but Iraq is undergoing reform, opening up to rapid infrastructure improvements and improved air access in an area for so long depleted by sufficient number of flights. Addressing local airport officials and media upon arrival in Erbil, Al Shehab said: “Erbil is the latest route launch for Qatar Airways in a busy year that now sees the fifth destination added to the carrier’s global network since January. “We have been working with the travel trade and corporations not only in Iraq, but around our network to build these two routes together. Located 350km north of the Iraqi capital Baghdad, Erbil is the country’s third largest city and fastest growing with a population of over one million people. Sitting on fertile agricultural land, Erbil and its surrounding area are rich in natural resources. The region is known for its significant gas reserves, including oil, gold and other deposits. There are multi-billion dollar infrastructure projects well underway covering healthcare, housing, energy, agriculture and technology to help with restructuring efforts to pre-war levels. Qatar Airways’ passengers flying to Iraq from destinations across the Gulf, Europe, Indian subcontinent, Asia Pacific and The Americas have excellent connections via the airline’s Doha hub. Since the beginning of the year, Qatar Airways has launched flights to five destinations – Baku (Azerbaijan); Tbilisi (Georgia); Kigali (Rwanda); and Zagreb (Croatia) with many more planned during 2012 offering customers greater choice. Over the next few months, Qatar Airways launches services to a diverse portfolio of new routes, including Perth, Australia (July 3); Kilimanjaro, Tanzania (July 25); Mombasa, Kenya (August 15); Yangon, Myanmar (October 3) and to the Serbian capital Belgrade during September. Qatar Airways has seen rapid growth in just 15 years of operation, currently operating a modern fleet of 108 aircraft to 115 key business and leisure destinations across Europe, Middle East, Africa, Asia Pacific, North America and South America.